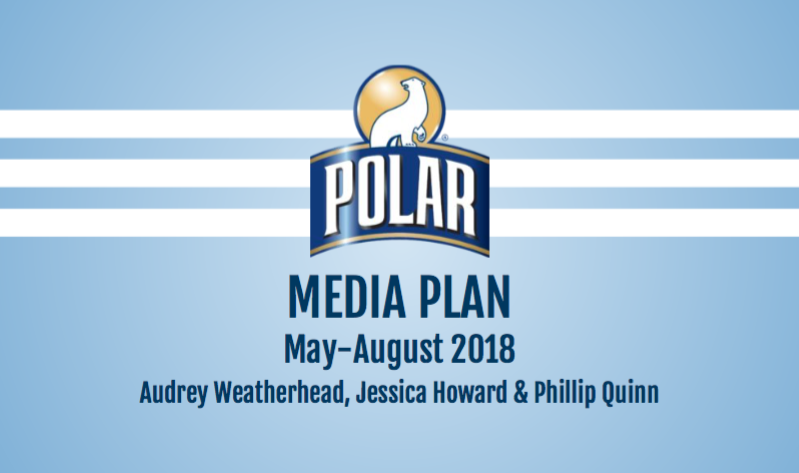 As a student of Dave Koranda's Media Planning class, our term-long assignment was to create a media plan to increase awareness and brand presence of Polar Seltzer water to two specific demographics in the Coos Bay, Corvallis, Eugene, and Roseburg, Oregon areas. Polar Seltzer has had a cult-following, competing with La Croix, on the East Coast for many years. Our job was to figure out how to bring that same popularity to the West coast, specifically targeting an increase in overall brand presence and reaching a desired demographic of "healthy" moms. After lots of research, my team of Audrey Weatherhead, Phillip Quinn, and I came up with our following solutions. Audrey, Phillip, and I presented this deck to our Client, Bigfoot Beverages, which is the current distributor of Polar Seltzer in the Coos Bay, Corvallis, Eugene, and Roseburg areas. This Deck was presented Wednesday, November 29, 2017.